There are two ways to send automatic out-of-office replies. The way you use depends on the type of email account you have. Click File, then select the image below that matches your version of Outlook. If you see the Automatic Replies button, follow the steps to set up an automatic reply. 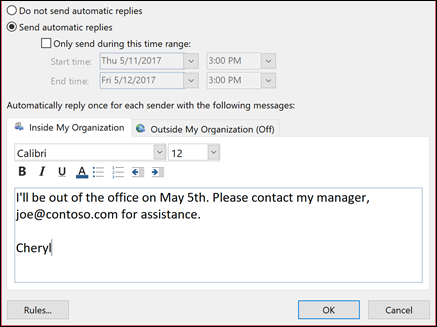 If you don't see the Automatic Replies button, follow the steps to use rules to send an out of office message. Select File > Automatic Replies. Note: For Outlook 2007 choose Tools > Out of Office Assistant. In the Automatic Replies box, select Send automatic replies. Optionally, set a date range for your automatic replies. This will turn off automatic replies at the date and time you enter for the end time. Otherwise, you'll need to turn off automatic replies manually. Note: If you don't see Automatic Replies, use Rules and Alerts to set up your out-of-office message. On the Inside My Organization tab, type the response that you want to send to teammates or colleagues while you are out of the office. Note: Sending automatic replies to anyone outside my organization will send your automatic reply to every email, including newsletters, advertisements, and potentially, junk email. If you want to send automatic replies to those outside your organization, we recommend choosing My contacts only. Select OK to save your settings. When Outlook is setup to send automatic replies, you'll see a message under the ribbon with this information. Select Turn off to disable automatic out-of-office replies. If you want to modify the dates for your automatic reply or the message sent, use the steps above to modify your settings. 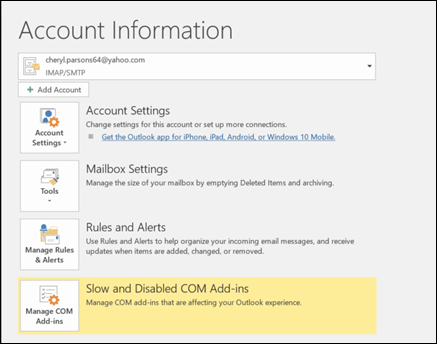 Note: For Outlook 2007, to turn off out-of-office replies, select Tools > Out of Office Assistant and uncheck the Send Out of Office auto-replies checkbox. If you don't see Automatic Replies after selecting File, you're probably using a Gmail, Yahoo, or other POP or IMAP account that doesn't support the Outlook Automatic Replies feature. 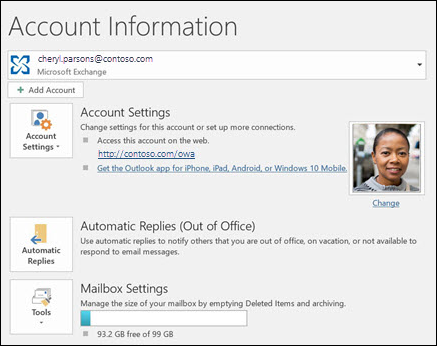 You can setup a rule that will reply to incoming messages, but only if you leave Outlook running. For more information, see use rules to send an out of office message.